The purpose of the Greenways in Raleigh and Cary are to interconnect so that you have access to miles of running, walking and biking trails without having to worry about being next to a major road. For folks in Cary, the Greenway signs are popping up more frequently and are visible to even those driving by. However, finding some of the Greenways and where they led to in Raleigh was becoming a bit of a struggle. During CityCamp, a local gathering of young people and the town of Raleigh to address “next-generation solutions”, a group came up with RGreenway. 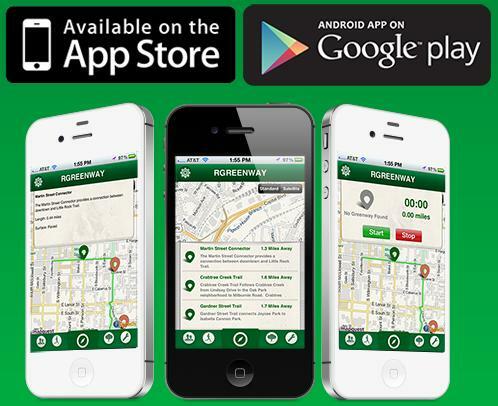 RGreenway is an App for the iPhone and Android phones where an individual can track where Greenways are, a map of where they go and can even report where some broken signs are along the path. Raleigh is trying to promote the 77-mile, 3,700-acre greenway system to increase the use of bicycles and walking over car usage. The town of Cary is trying to do the same by connecting the greenway locations to make it easier to travel to work by bike. Of the 140,000 residents in the Cary area, only about 200 people regularly bike to their office. Keep an eye out for these Greenway signs and get the App for yourself to see all the routes they have to offer the next time you plan a shopping trip or just a day on the town. Posted on July 3, 2013 by marykim1 •	This entry was posted in Lifestyles of Cary, Lifestyles of Raleigh and tagged Android, App, Bicycling, Cary, Commuting, Did You Know, Greenways, Helpful Tips, iPhone, Location, NC, Raleigh, Technology, Town Information, Work. Bookmark the permalink.